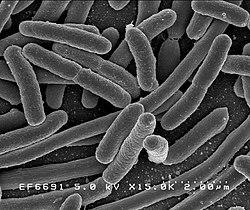 Escherichia coli or E. coli is a bacterium that can be found in human intestines. Scientists have studied E. coli very extensively, and know more about how E. coli cells work than any other organism. E. coli is not always harmful. In fact, the only known harmful strand is O157. E.coli is a prokaryotic organism. E. coli normally grow in soil and in the large intestines of many mammals, including humans. Most strains of E. coli do not cause disease, but instead help animals get vitamins and digest food. Some strains of E. coli cause sickness in people. E. coli are not usually in food or water. When food has not been prepared with clean equipment, E. coli can grow in the food. When E. coli are found in water, this may mean that the water has touched sewage. It is named after Theodor Escherich, who discovered it in 1885. It was officially named after him in 1919. The following signs and symptoms of an E. coli infection normally happen within three days; however, some people may carry the infection and show no signs at all. The best treatment for E. coli is plenty of fluids to avoid dehydration. ↑ 1.0 1.1 1.2 1.3 Nordqvist, Christian (21 April 2007). "What Is E. Coli? (Escherichia Coli)". Medical News Today. Retrieved 27 March 2012. This page was last changed on 16 April 2019, at 22:14.